The signing of the U.S. Constitution on 17 September 1787 was a milestone in creating a government for the recently independent United States. However, the act of signing itself did not create a government. Nor did it bring the new Constitution into force. The closing of the Constitutional Convention was the beginning of a long public debate during which citizens, represented in state ratifying conventions, read, debated, and ultimately voted to ratify the Constitution. The process of ratification produced an invaluable record of debates and commentaries that reveal how eighteenth-century Americans understood the Constitution and how they assessed its strengths and weaknesses. Beginning with the publication of the first volume of The Documentary History of the Ratification of the Constitution (DHRC) in 1976, DHRC editors at CSAC have been publishing the definitive collection of primary source material related to the ratification debates. Editors draw on a body of more than 70,000 documents, including official materials, such as records of town meetings, legislative proceedings, convention journals and debates, and forms of ratification; personal papers, such as letters, memoirs, and diaries; diplomatic correspondence; and printed primary sources, such as newspaper articles, broadsides, and pamphlets. These documents have been transcribed, annotated, and published in twenty-nine volumes (to date) totaling more than 15,000 printed pages. 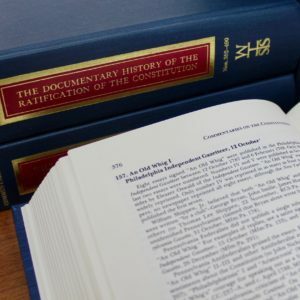 DHRC volumes have been used extensively by historians and political scientists, cited by the Supreme Court of the United States and other federal courts, and increasingly adapted for use in classrooms at all educational levels. The volumes are essential reading for anyone wanting to understand the Constitution in historical context. DHRC volumes are available at no cost through the University of Wisconsin Libraries’ Digital Collections. Volumes published after 2015 will be available following a two-year embargo. Online access is also available by subscription through Rotunda, a digital publications collection at the University of Virginia Press. Bound volumes are available at most research libraries and can be purchased from the Wisconsin Historical Society.